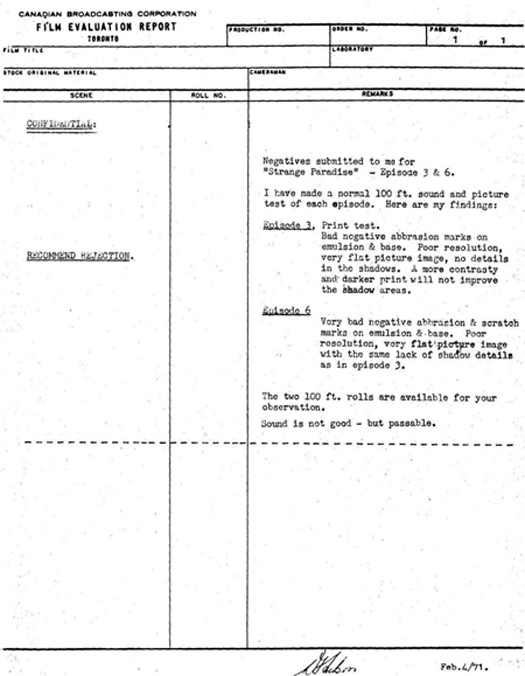 In early 1971, Vikoa, the parent company of Krantz Films, contacted the CBC in reference to several negatives that were supplied to them by the CBC for the purposes of striking prints for Latin American markets. According to Vikoa, a number of negatives were unusable due to various imperfections. To verify this, the CBC performed their own analysis on randomly selected episodes. 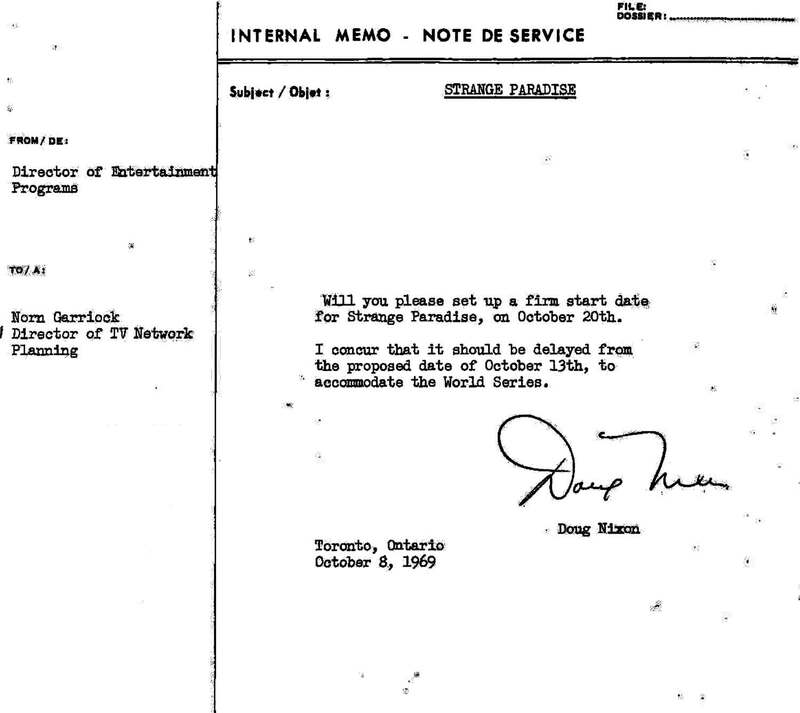 The memo at right indicates that both of the tested episodes (episodes 3 and 6) did indeed have flaws. As a result, the CBC paid for the creation of another set of negatives to replace the damaged episodes. 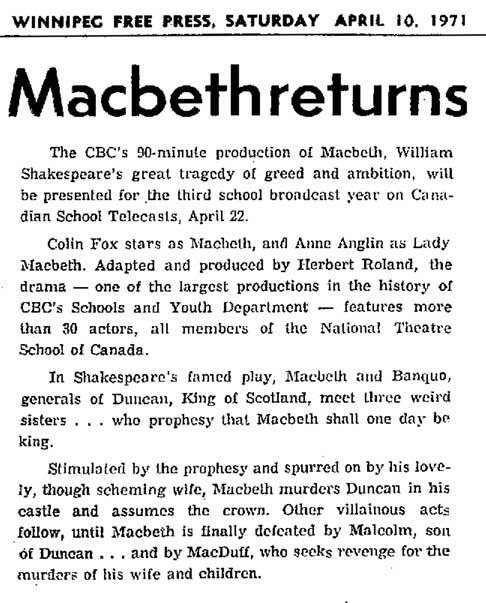 This week brings a short newspaper article from the Winnipeg Free Press from April 10, 1971. This particular version of Shakespeare's classic play was adapted by Strange Paradise alumnus Herb Roland and starred Jean Paul himself, Colin Fox. It also was the most elaborate production in the history of the CBC's Schools and Youth department. At right is the original character outline for one of the new characters in the Desmond Hall storyline, Laslo Thaxton. 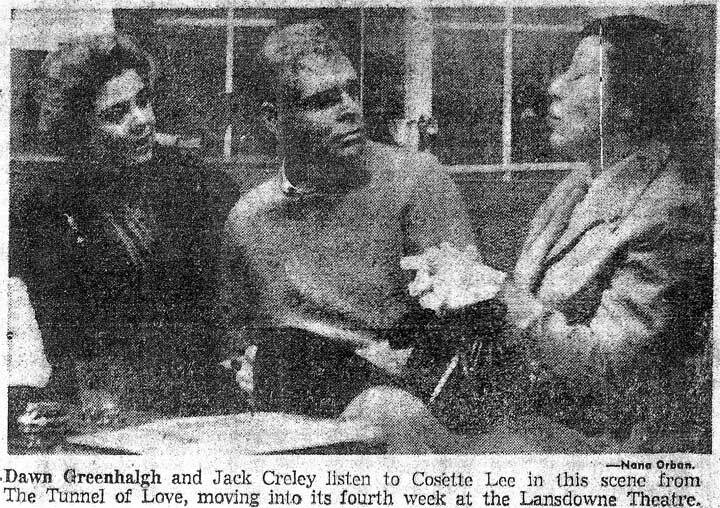 Played by Jack Creley, Laslo became Jean Paul's main human nemesis after his journey from Maljardin to the ancestral home of Desmond Hall. 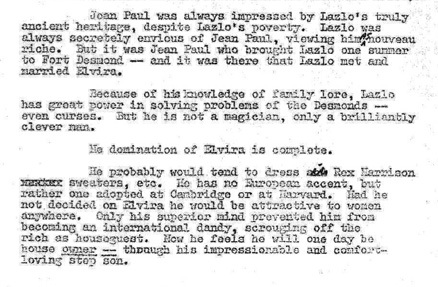 As can bee seen in the document, the original backstory envisioned Laslo as "attractive to women everywhere" and having him brought to Desmond Hall and introduced to Elvira (the original name for Ada) by Jean Paul, all items that were either dropped or changed for broadcast. Additionally, Laslo was originally to be the keeper of the Desmond family knowledge, a task that eventually went to researcher Emily Blair. 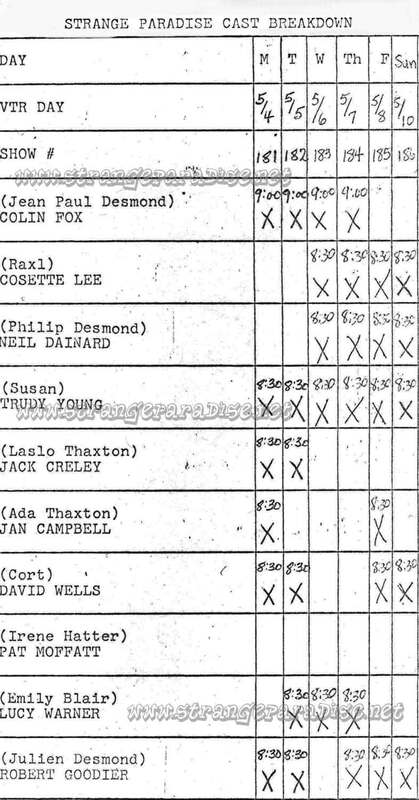 This week the archive goes all the way back to 1920 to bring you Cosette Lee's first professional billing. At age 10, Cosette Lee performed as an impersonator as an opening act at a local movie theater. As you can see by the ad, she had not yet adopted her stage name of "Lee" and was billed under her real last name of Le Gassicke. Also not the misspelling of her first name as "Cossette."